How to view request and response raw messages in SoapUI? Request raw message is the actual data SoapUI is sending to the remote server, when you run a request. The Request raw message includes the GET, POST or other HTTP method line, request headers, and the request body. Response raw message is the actual data SoapUI receives from the remote server, including the status line, response headers and the response body. You can follow this tutorial to see how to view request raw message in SoapUI. 2. Click "File > Import" menu to open your first SoapUI test project stored in "\fyicenter\First-project.xml". You see the test project displayed in the project explorer panel on the left. 3. 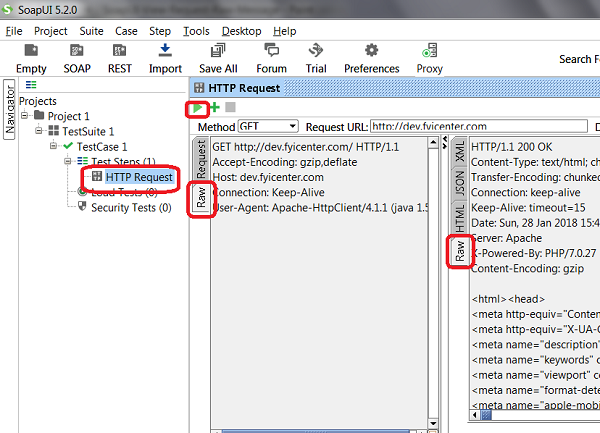 Double-click on "HTTP Request" test step under "Project 1 > TestSuite 1 > TestCast 1> Test Steps". You see the "HTTP Request" window. 5. Click the "Raw" tab on the request panel on the left. You see the request raw message, starting with the GET request line. 6. Click the "Raw" tab on the response panel on the right. You see the response raw message, starting with the status line of "HTTP/1.1 200 OK".